Our goal is to tell as many children as possible about the circular economy and how they can contribute to this now and later. Schools are important partners to achieve this goal. Earlier this year, we had the opportunity to carry out the first pilot of 7 DaysCircular. Now, all the assignments that were developed at the time and a number of new ones are online: freely available for every teacher who wants to work in the classroom on the subject Circular Economy. 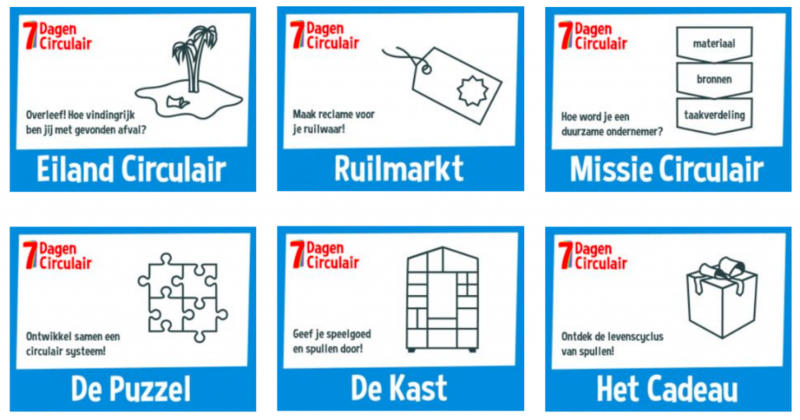 At the start of the year we had the change to, with the help of a few partners and a subsidy from the Duurzaam Door programme, make a start with 7DaysCircular. In March the day finally arrived: a pilot at primary school Wijzer aan de Vecht in Utrecht, where 41 pupils from group 6, 7 en 8 took a journey with us through the circular economy. Not much later we got the opportunity to offer the programme again to a school. Unfortunately it wasn’t possible to programme such a project week before the summer holidays (a requirement). We also noticed that not all schools were clear about what a circular economy entails. In consultation with the Natuur en Milieufederatie Utrecht (who coordinated the programme) we reached the agreement to make all lessons that were developed and also a few new ones available online: the start of our lessons menu on the website. The Circular Economy is a big and broad subject. But in our view it can start very small, with a little bit of awareness, an experiment, a game. It’s a topic that should not only get the attention of companies and policy makers, but should also be shared with the youngest participants in our society: pupils in primary schools and secondary schools. Not only because it concerns their future, but also because it is important to share the necessity for and information about the circular economy during these formative years. What inspires you at a young age, motivates you later in life. Recently I spoke more on this as a guest of the What if Waste Podcast. The best way to multiply is to share. For many schools the circular economy is a new subject. We hope to lower the threshold to discuss this topic in the classroom by applying one or more of the assignments in our lessons menu. Each assignment has a brief and a work sheet available, so every teacher can start quickly with their pupils. All the materials are free to download (you don’t even need to make an account!) and can be used under an Attribution-NonCommercial-NoDerivatives 4.0 International (CC BY-NC-ND 4.0) license. to adjust the work — to remix, to change and make derivative works under the terms of attribution (leave the logo of 7DaysCircular on the brief and work sheet), non-commercial use and share-alike (If you remix, transform, or build upon the material, you must distribute your contributions under the same license as the original). We wish you lots of fun with the material and let us know how the lesson went! Share your story on social media and tag us @7DaysCircular. We would also love to hear your feedback and ideas for more fun lessons on the circular economy.